Are you feeling inspired to put on your own circus performance? Or tempted to make some delicious ice lollies of your own? 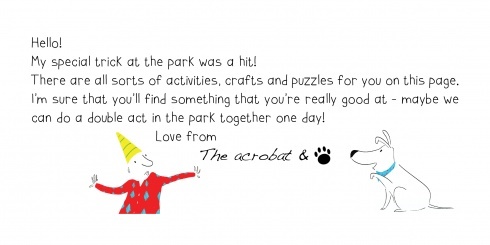 Find lots of fun ideas that are related to The Acrobat on our activities sheet! Click the thumbnail below for a preview! why not print off our crafts sheet? Click here to download the crafts sheet! (1,109KB)Click the thumbnail below for a preview! Our songs sheet has funny rhymes to learn and sing along to! See if you can spot all of the differences! Use paints, crayons and felt tip pens to design your own kite! Are you good at following paths with a pen or pencil? Once you have mastered that, have a go at the challenging finale! Here are some acrobat bookmarks for you! Please ask an adult to print them off and cut them out.